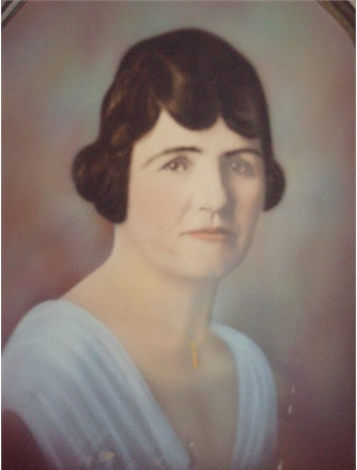 Lovina Arsula Spencer – was one of my great grand aunts of the Spencer line – and one of the daughters of Richard Henry Spencer and Lucy Lodica Elmer who was born in Payson, Utah County, Utah on 25 Aug 1879. While still an infant, Lovina’s father relocated the family to Sanpete County where she spent the remainder of her childhood. On 15 Mar 1899, at the age of 20 years, Lovina married Oscar Eli Olsen in Mount Pleasant, Sanpete County, Utah. 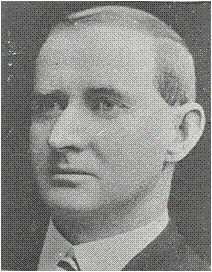 Oscar, the son of Swedish immigrants, was born to James (or Jons) Peter Olsen and Margaret Christina Caroline Miller on 17 Aug 1873 in Utah. He was also the older brother of Henry Peter Olsen who married Lovina’s older sister, Lucy Ann Spencer. 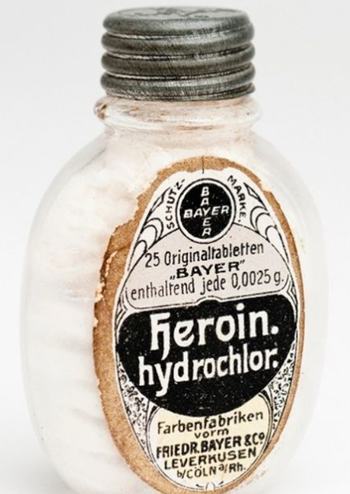 To complicate the marriage triangle a little further – Oscar had previously been married to Lovina’s half-sister Martha Jane Spencer (1870-1895), the daughter of Jerusha Elmer and Richard Henry Spencer. I know – it’s hard to keep up with these large extended Mormon families! Lovina and Oscar spent the first twenty or so years raising their family in Sanpete County, Utah. 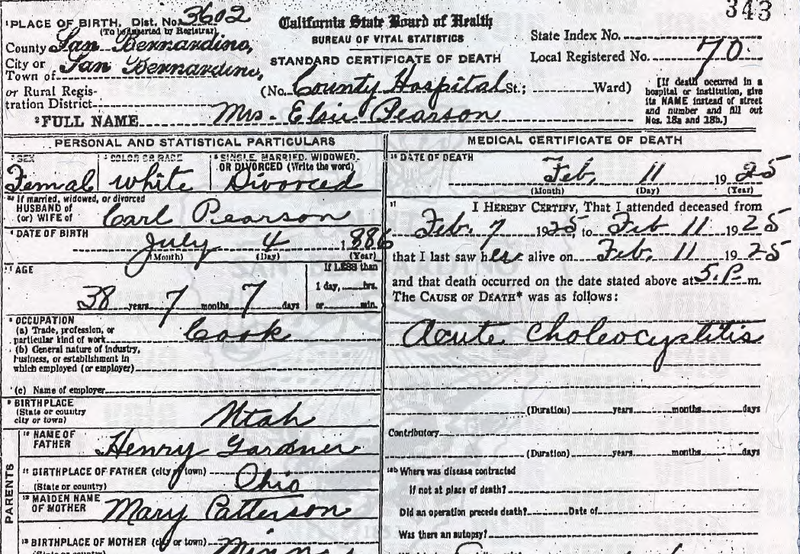 The census records are confusing to interpret, but it is believed that Lovina may have helped raised her husband’s son Earl (from his first marriage); Lovina and Oscar appear to have had at least four children of their own: Vernon born in 1901; Alvin Leo born in 1904; William O. born in 1907 and Dean born in 1911. (The records conflict as to whether Dean is a male or a female.) The family owned a home, which was free and clear of a mortgage by 1910. Oscar always lists himself as “farmer” in the census records. 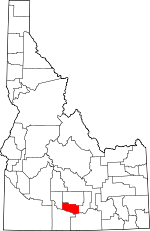 By the time that the 1930 census was taken in April of that year, the Olsen family had relocated to Northwest Jerome, Jerome County, Idaho. Oscar is 56 years old and Lovina is 50. They own their own home, but no occupation is listed for either of them. Three of their adult children are still in the home with them: Alvin L., 25, farmer; William O., 22, mechanic; and Deane McK, 19, salesman at grocery store. Vernon cannot be found in this census period. By all accounts, Lovina and Oscar lived out their lives in Jerome, Idaho. Nothing is known to me after the 1930 census. 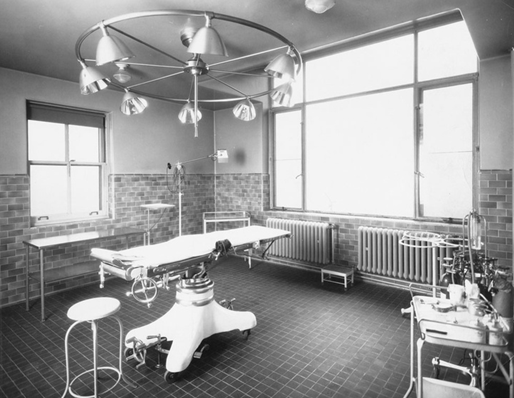 Lovina lived a long life – dying at the age of 101 – on 4 Jan 1981. According to the Social Security Death Index, Lovina’s last place of residence was Jerome, Jerome County, Idaho. She was returned home to Mount Pleasant in Sanpete County, Utah, where she was laid to rest two days later on 6 Jan 1981. 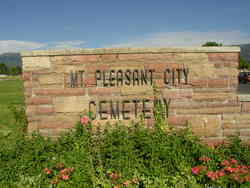 Her husband Oscar Olsen, who died many years before her in 1933, is buried at Mount Pleasant with her. I know virtually nothing about the Olsen children. 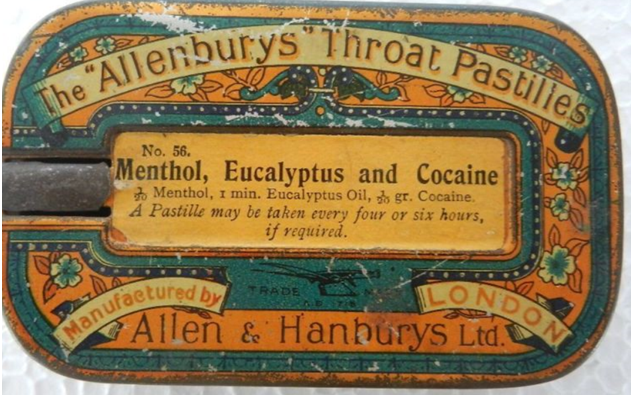 I would love to hear from any of you that are researching this particular branch of the family. After I finished writing the synopsis for Lovina and Oscar – I was thinking to myself, “well how boring is this?” “I have nothing but names and dates.” “Who wants to read this?” Nonetheless, every life and family matters, and I am hopeful that sometime in the future a family member may stumble upon this post and learn new things about their Olsen ancestors. In one of my recent posts I discussed “Women in Mormonism“ – let’s talk about the men today. It is a well known fact that the Mormon sect practiced polygamy. This concept fascinates me and revolts me all at the same time. My gg-grandfather, John Henry Spencer, was converted to Mormonism while still a child in England. He came to America with his family onboard the passenger ship Sheffield in 1841. Once the family made land fall at the port of New Orleans, they journeyed up the Mississippi River and joined the “Saints” at the “Kanesville Branch,” now known as Council Bluffs, Iowa. The family was living in Kanesville when Richard Spencer, my ggg-grandfather, and John Henry’s father, was killed on 22 Aug 1851 in some sort of an accident involving a horse – the details of which are unknown to me. That next year, in 1852, John Spencer, along with his mother Mary and siblings, set out for Utah. They traveled (along with 200 other people) with the Third Company under Captain Thomas C. D. Howell. They left Kanesville, Iowa on 7 Jun 1852 and arrived in Salt Lake City on 27 Sept 1852. The next month in October of 1852 the family relocated to Payson, Utah. It was in Payson that John met and married Jerushia Kibbe Elmer on 4 July 1858 (sealed for time and eternity). They became the parents of 14 children. On that very same day, John’s brother, Richard Spencer married Lucy Lodica Elmer, Jerushia’s niece. Sadly, Richard Spencer died shortly after he married Lucy Lodica Elmer. The family story that has been passed down indicates that Richard Spencer and his wife Lucy Lodica attended a dance soon after their marriage, and being over heated and perspiring, he left the hall and laid down on a pile of wood to cool off – where he contracted a “lung fever.” It has been claimed that on his death bed he asked John to marry his widow and raise a family “for him.” Accordingly, about two years after Richard’s death, John Henry Spencer married Lucy Lodica Elmer on 7 Oct 1860 (for time only). (In a nutshell – the marriage with Jerushia is for “time and eternity” and the marriage with Lucy is “only for this lifetime.”) To this union ten children were born. 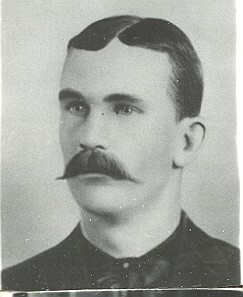 Along with many of the other Mormon men, John Henry Spencer was prosecuted later in life for practicing polygamy (unlawful cohabitation and adultery). He gave bail to await the Grand Jury action. His plural wife, Lodica, also gave bond to appear as a witness. The trial transcript reads: “Bishop John Spencer of Thistle married his second wife in the fall of 1860, had been taking care of his family since. He had lived with the Indians for the last twelve years and was a poor man. His youngest child was four weeks old and they have very little means. The court asked the defendant if he had taught the Indians anything about polygamy and he said, “No”. He was sentenced to a term of four months in prison. During that time his family suffered; however, was able to sustain themselves through the coldest winter they had experienced. 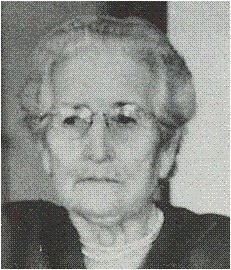 My great grand aunt, Lucy Ann Spencer, did not live a long life. 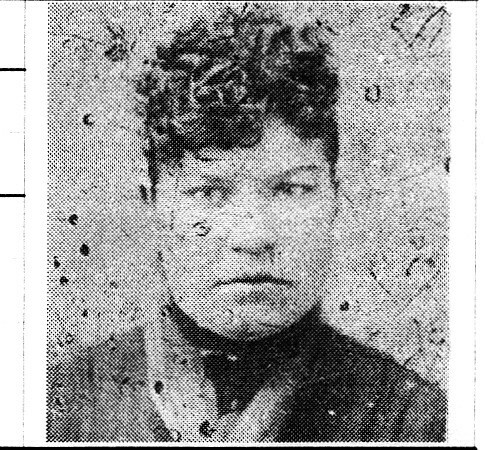 She was one of the daughters born to John Henry Spencer and Lucy Lodica Elmer in Payson, Utah on 23 October 1875. Lucy can be found in only one census record, and that being the 1880 census when she is only 5 years old. She is with her parents John and Lucy Spencer living in Thistle, Sanpete County, Utah. Also in the home is John’s “other” wife Jerusha (remember polygamy among the Mormons). Between the two women there are 11 children in the home ranging in age from 9 months to 17 years. Lucy’s story is a tragic one. She gave birth to six children – three boys and three girls. None of her boys survived their infancy. The following children were born to Lucy and Henry: John Henry in 1896; Lucy Pearl Lena (1897-1990); James Edgar in 1900; Mary Alice (1902-1991); Annie Ethel (1905-1921); and George Elmer in 1908. The last boy, George Elmer was born 20 Aug 1908. 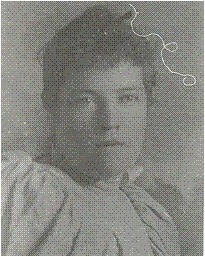 His mother, Lucy Ann Spencer Olsen, at the age of 32, died five days later on 25 Aug 1908. Baby George died the next month on 13 Sept 1908. Henry and Edna had five known children: Hannah Levender Olsen born 1910; Joseph Peter born 1912; Cleo born 1915; Rex T. born 1918; and Helen Esther born 1919. And again tragedy would strike this family. Barely three months after the birth of their last child, Helen Esther, Edna Shepherd Olsen died at the age of 30 on 22 Feb 1920. ﻿Such heartache cannot be fathomed. Henry Peter Olsen did remarry; however, I know nothing about his third wife other than her name: Eliza Jane Neilson. It is believed that this couple did not have children. Henry died of heart trouble at the age of 67 on 5 April 1943. He is laid to rest in the Mount Pleasant City Cemetery with his first two wives, Lucy and Edna, and several of his children.